No More School! No More Work! Or should I say, “no more work for which I shall get paid!” I will still be doing regular Mom duties (chef, chauffeur, psychologist, play therapist, librarian, janitor, mechanic, tour guide, entertainment coordinator, nutritionist, and matriarch, of course). But for the summer I am done being an education professional. It feels bittersweet. 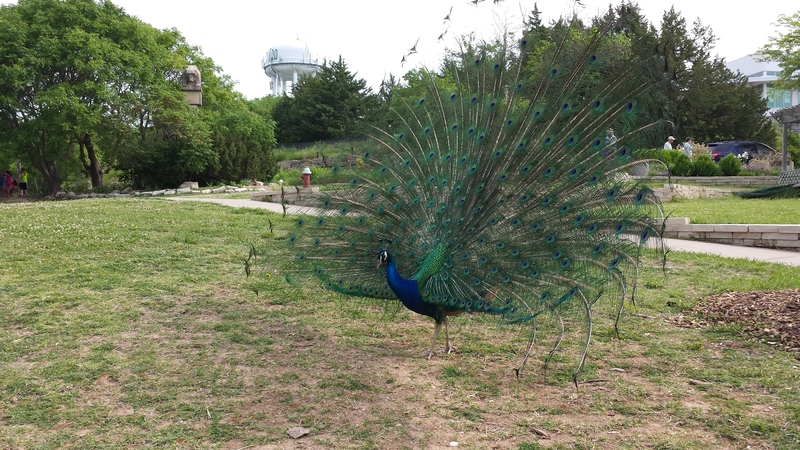 A peacock at the zoo. Picture taken by my student during the field trip. Today I was definitely ready for summer vacation. Hell, I was ready for two months ago, shortly after I started working full time. I got sick, really sick, and haven’t recovered. So for me, a long rest — or what I imagine could be a long rest — might put me back on my feet for the next school year. Just making it day to day seemed impossible, and with less than one month of school remaining, I managed to catch a nasty stomach flu and then develop bronchitis, which persists even as I type. Today as I helped the children pack their backpacks one last time, I felt a mix of relief and sadness. I desperately need to rest and regain my strength, but I will miss not seeing “my kids” every day. Even if I never go back to work at the school, I can take that memory with me forever and be satisfied that I did my best job there. This entry was posted in Daily Thoughts, Parenting and tagged Classrooms, Education, Education Professional, Leaving Work, Paraprofessional, Summer Vacation, Working with Children on May 23, 2014 by Georgeann.